Even simple engagement rings have rich symbolism. The first recorded diamond engagement ring was exchanged in 1477 when Archduke Maximillian presented the token to his betrothed Mary of Burgundy. Prior to that event, engagement rings were either plain metal bands (iron for commoners, while gold and silver were used among royalty) or used less expensive gems. Today, solitaires are the most popular choice for many couples, but different gems are growing in popularity. Initially, engagement rings may have represented a portion of a bride's dowry or bride price. Not only did the ring advertise the woman's committed status, but the quality of the jewelry indicated the social position and prosperity of her groom. It is believed that the ancient Romans began the practice of placing the engagement ring on the left ring finger, which they believed contained the "vena amoris" or vein of love which supposedly connected directly to the heart. Other ancient cultures, including the Egyptians, also used such symbolism, and even today the tradition persists both with engagement rings and wedding bands. In fact, wedding bands are placed first on the left ring finger to be closest to the heart. Engagement rings are ultimately circles of metal, and the circle is a part of very sacred, symbolic geometry. Circles have no beginning and no end and thus represent eternity, renewal, wholeness, and perfection. They are also symbolic of the sun, moon, and planets, bringing together all life just as an engagement ring brings together the lives of two people. During World War II, when many young men left behind their wives, girlfriends, and fiancées, the practice of a double ring wedding ceremony became widespread in the United States. In a double ring ceremony, both the bride and groom receive wedding rings, whereas earlier traditions only gave a ring to the bride. Today, most couples have double wedding ring ceremonies, and the popularity of men's engagement rings is growing to extend that symbolism. Many couples choose engagement rings infused with personal symbolism. Celtic engagement rings are heavily symbolic with family knots and ethnic traditions, while antique rings may be family heirlooms that carry on intimate traditions. Designer engagement rings often have unique elements such as delicate filigree patterns that spell out words or dates, and unique settings can be used to incorporate a couple's individual tastes for personal symbolism. 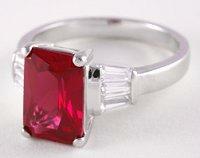 Another method of incorporating personal symbolism is to create birthstone rings. These gemstone rings may use particular birthstones to represent the bride and groom or the significant dates of their relationship, such as their first meeting, first date, or first kiss. Three stone engagement rings are themselves imbued with personal symbolism. Each of the stones represents a different stage in the couple's relationship: their past, present, and future. Three stone rings are available in different shapes, though round, emerald, and princess cuts are the most common. 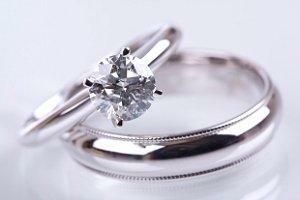 Engraving engagement rings is another way to add symbolism to the jewelry. While some cultures believe that engraving the circle of the ring will bring misfortune because it symbolically weakens the metal (there is no difference in actual strength or durability), others feel that it adds intimacy and uniqueness to the ring and creates a stronger bond in the relationship. Whatever the personalization, there is no denying that engagement ring symbolism factors heavily into a couple's choice of ring. Whether they choose a classic diamond solitaire to honor traditions, an heirloom ring to include family, or a completely new ring with personal symbolic elements, the most important thing is that the ring truly represent the love, honor, and commitment they will share for many years to come.